Real Madrid coach Carlo Ancelotti says the club are in talks to sign Tottenham star Gareth Bale. Ancelotti's comments follow reports that Real are preparing a bid in excess of the world record £80m fee they paid for Cristiano Ronaldo in 2009. 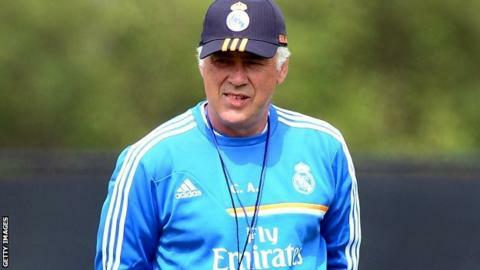 Ancelotti told a news conference at Real's training camp in Los Angeles: "I believe the club is in talks to find a solution and we will see what happens." However, it is believed no formal bid has yet been submitted by Real. Bale, 24, reported to Tottenham's training ground on Wednesday, undergoing treatment on the leg injury which forced him to miss their last two pre-season matches. Ancelotti, who took charge at the Bernabeu earlier this summer after leaving Paris St-Germain, was asked about the possibility of adding the Wales international to his squad this summer. "It is difficult to talk about Bale because he is not a Real Madrid player at present," he added. "I have never spoken to him. I do not usually talk to players who are not from my team and it would not be fair to do so." Ex-Chelsea boss Ancelotti said former Tottenham playmaker as part of any deal for Bale. "It is not true that Modric is going," said the Italian. "He is a very important player for us and he will be here this season." Bale, who joined Spurs in a £10m deal from Southampton in 2007, was named as the player of the year by both the Professional Footballers' Association and Football Writers last season after scoring 26 goals for the White Hart Lane side. Madrid have already spent in excess of £50m this summer, bringing Spanish midfielders Asier Illarramendi from Real Sociedad and Malaga's Isco for £34m and £23m respectively. They also exercised a buy-back clause on midfielder Dani Carvajal from Bayer Leverkusen and made Brazilian midfielder Casemiro's loan from Sao Paolo a permanent deal.